A Syrian family aims to cycle to the Turkish capital Ankara to "thank President Recep Tayyip Erdoğan for embracing Syrian refugees". 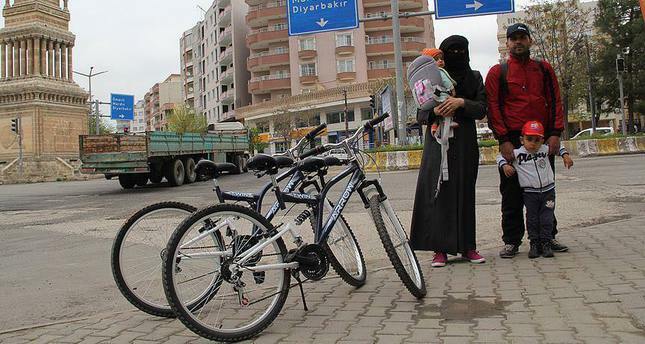 30-year-old Mulhem al-Said, his wife Mey Besrini, 20, their toddler Hamza and six-month-old baby Huzeyfe started pedaling from Midyat district in Turkey's southeastern Mardin province and have arrived in southeastern Şanlıurfa province. Thursday's destination was Sanliurfa and the family met officials of a religious school in Viransehir district and took thank-you letters penned by Syrian students there. Working as a teacher in Mardin, Said said they set out to convey their wishes to Erdoğan and continued: "No country [helped] Syrians other than Turkey; we set out to show our appreciation, visiting districts and provinces and are taking demands and thanking letters from teachers and students there."